Once in the midst of a seemingly endless winter, I found within myself an invincible spring. Spring has finally arrived in Colorado! I didn't know if it would happen this year. We seemed forever locked in an eternal winter, despite my spring state of mind. But, the last week has been one of transformation. Warm and sunny, the grass is verdant green, and the Brandywine apple tree in my garden is finally bejeweled in rosy pink buds. I can hardly wait until they burst open and fill the garden with the ethereal aroma of apples and roses. This metamorphosis has been so sudden I wonder if I'll wake soon and find it's all a dream. 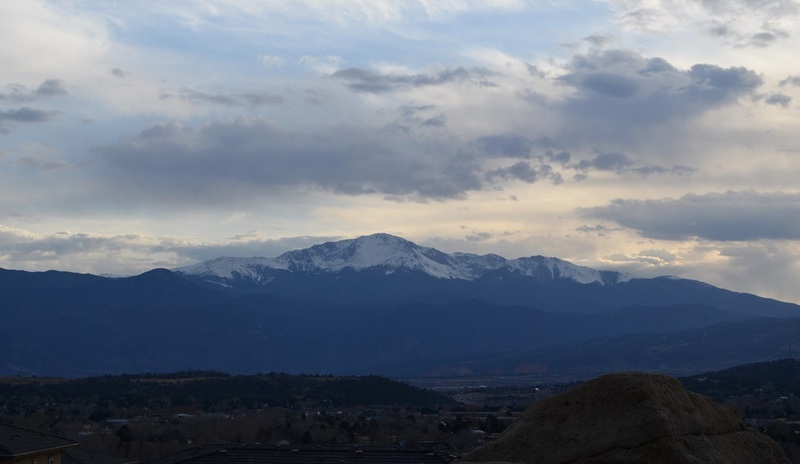 Though our days are filled with sunshine, the nights are still cool and the mountain peaks are still frosted with a layer of clean snow, glowing like alabaster in the fading sun. 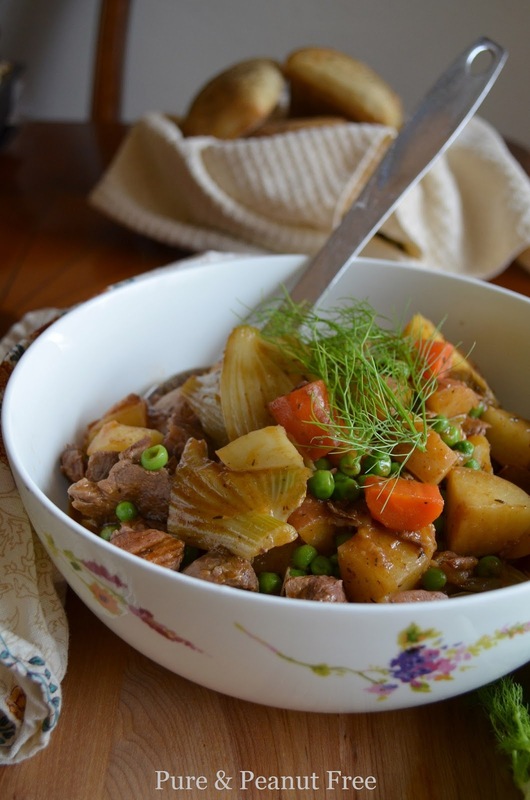 Nothing warms up a cool spring evening like a bowl of lamb stew. It's something I crave when the weather begins to warm, and I set the table out under the trees. We're still wrapped in sweaters and scarfs at dinner time, but it's nice to eat outside again. I found a few gorgeous heads of fennel at the market yesterday, lacy and delicate. They seemed to call to me as I passed by and I couldn't resist. I also picked up some plump spring peas. Tender and sweet, they taste like rain. 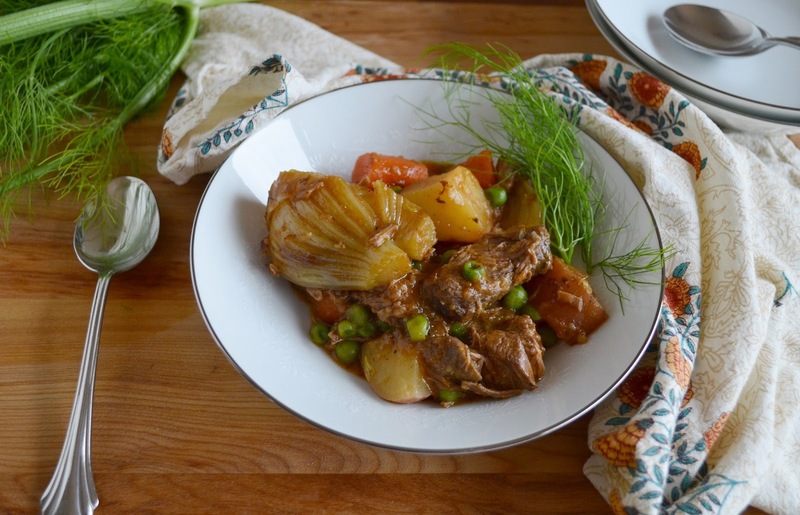 I prepared this stew in the slow cooker, but it can just as easily be prepared in the oven. Just cut the cooking time in half, and use a cast iron Dutch oven with a tight fitting lid. 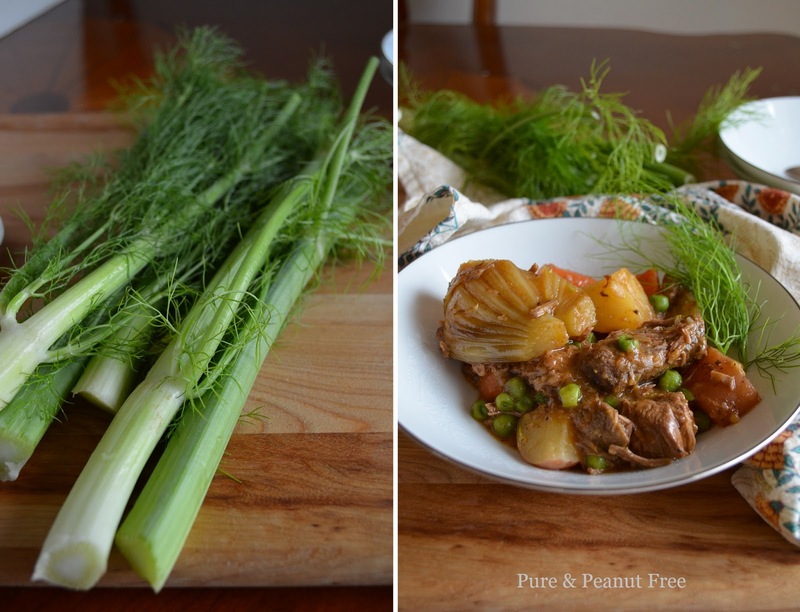 When cutting the fennel remove the leafy tops and reserve them for garnish. Cut the bottom off the bulb and peal away any browned or discolored spots on the outer layer. Slice the bulb in half lengthwise, and then cut each half into 3 or 4 wedges making sure each piece is held together by a bit of the core. This will insure that it stays together during cooking and will look nice on the table. Serve the stew with a good, hearty loaf of bread to sop up all the beautiful juice. Preheat the slow cooker on high while you prepare the meat. Heat 2 Tbsp. oil in a large sauté pan until it shimmers. Meanwhile, toss the lamb with the salt, pepper and flour. Brown the meat in batches until very brown and caramelized. Transfer to the slow cooker and continue browning the meat until finished. Add the remaining 1 Tbsp. oil to the pan and cook the shallot and garlic until soft but not brown. Stir in the tomato paste, anchovies and thyme and cook until fragrant and the anchovies begin to dissolve. Stir in the wine and bring to a boil. Add the chicken stock and bay leaf and continue to stir, scraping the bottom of the pan until boiling. Pour the sauce over the meat in the slow cooker. Turn the slow cooker to low and cook for 4 hours. Yes, spring and summer arrived at the same time. I am so happy. But, snowing in the mountains again today! That's my kind of stew and I have made similar ones with lamb or beef. I add red wine to mine.